Whew! This has been a very busy 2017 already. We had two successful speaking projects; one with the Laurel Garden Club in Springfield, VA February 28th and one at Fort Myers Army Officer Spouses Club of Greater Washington Area (AOSCGWA). We have three volunteers from the Laurel Club; Carrie, Judy and Joyce. Thanks for all your support. Our St. Patty's day flower event for the Wounded Warrior Aleethia Dinner at the Fairfax/Arlington Elks club was wonderful. Thanks to everyone who baked delicious "Green" cupcakes for this occasion. They were deeply appreciated by all. We had several new happy volunteers who came to learn and try their hands at creating flowers for this event. They had attended our speaking engagements and came to help at this event. Once again our thank you notes from Margaret say it all. And she includes a collage of our flowers from the dinners. We love the families and warriors that Margaret and Hal support every Friday night at the dinners. We have met some of the most interesting veterans. Thank you and your band of "Freedom Petals" volunteers for all the beautiful floral arrangements that brighten up the room and filled the room with smiles. 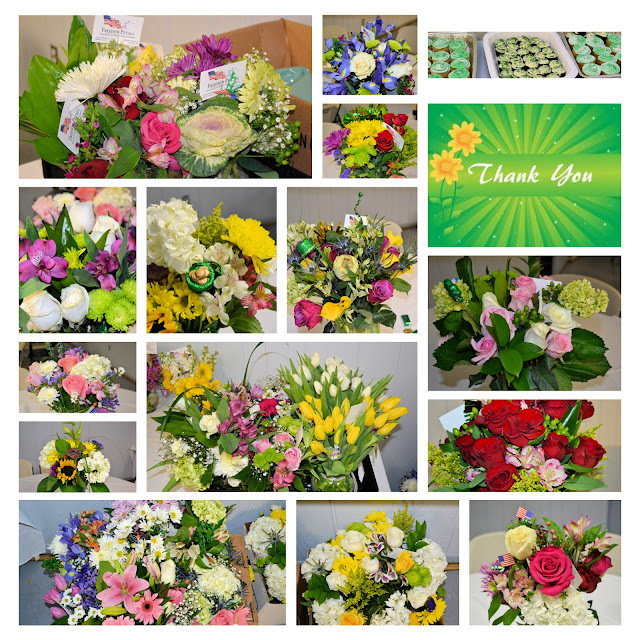 Over 60 wounded/injured/ill service members, their families and guests enjoyed the "St Paddy's Day" theme flower arrangements at Aleethia's Friday Night Dinner held on March 17th at the Fairfax Elks Lodge. Flowers bring a moment to forget about our troubles. Many attending the dinner are going through cancer treatments and the flowers certainly lifted their spirits. The extra bouquets were taken back to the Fisher Houses to bring joy to those unable to attend the dinner. Also, we thank the volunteers who provided the "dozens" of amazing "green" cupcakes We took a few back to Fisher House 5 that has many children residing in this house. We heard they were eaten within minutes of the delivery and left many "green" smiling faces!!! We always enjoy when Freedom Petals makes everyone have that warm and fuzzy feeling when being in a room filled with flowers! In April Freedom Petals with the help of Anne Harvey from the Herndon Florist will be providing flowers to a veteran that we met at the March Aleethia dinner. He is getting married in April at Walter Reed's Chapel. PWInstitute is well-known institute which offers piping jobs in Gujarat. Our professional team personally take care of each students. Visit us to know more. weddings are a very special occasion. you want everything perfect. Freedom Petals Inc. and The Herndon Floris didnt dissapoint us.their flower arrangements were amazing and unique! The reason I liked here is that these rental spaces for parties are so intimate and personable and while having astounding atmosphere! Really more suited and perfect for experiencing great food and having a good time.